Super nice minimal UI, everything is where it’s expected it to be. I’m a fan of the transitions between views and the classy hover effects. Left side of the application displays options where you can select to view by “Song”, “Author”, “Album”, “Genre”, “New”, “Thumbs Up” or playlists. When one of those is selected the right column populates with a detailed view in album cover view except for song title which will give you a neat sortable table. The only qualm I have is that I didn’t know songs could be played by double clicking since web-apps don’t typically have that characteristic, but I would have stumbled upon it eventually. I often have a hard time finding the play button on iTunes pretty frequently but don’t think I could ever have that problem here since the icon flashes as the song plays. Though it may seam basic and possibly limiting to some people, I’m a fan of this search and I’ll tell you why. This search doesn’t care if I’m looking for an album artist or song title, it just gives me the results I want whereas in iTunes I have to select one of those options with a checkmark or be faced with a ton of results. When using the web app, keyboard controls cannot be accessed if the tab isn’t in focus. Can’t think of any form of this feature in iTunes, I’d hope that right clicking the iTunes doc would but it doesn’t so I think this feature is pretty nice. I’m a big advocate of using the iTunes 5 star rating and make an effort to rate every song in my music collection. Every couple of weeks I delete stars with one star because lets be serious who wants to hear songs they don’t even like? Anyway, this rating system is too limited for me though. Resizing browser hides the controls for volume shuffle and repeat. Site is unusable if sized down too small. 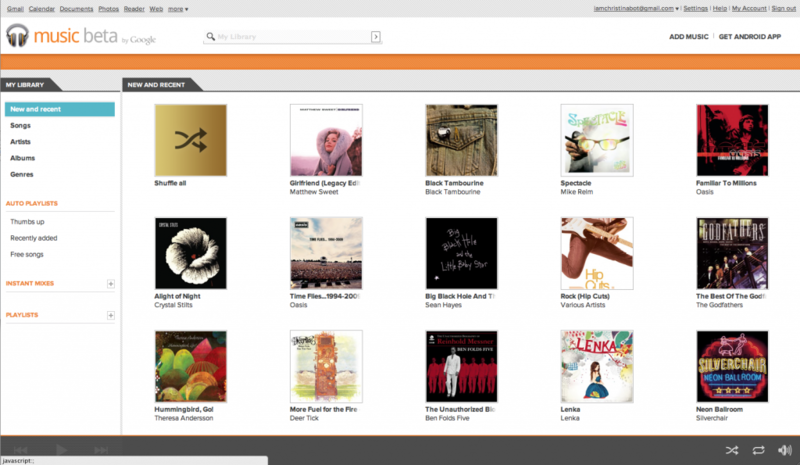 Knowing that Google Music is still in Beta is very promising.